A couple of weeks ago on a Saturday night, the last performer finished their story and the host of the show wrapped things up. Thus ended the latest season of the Stories We Don’t Tell. Almost every month since September 2017, Stefan Hostetter and I have organized the event bringing together amazing storytellers and incredible audiences in different apartments and houses across the city. 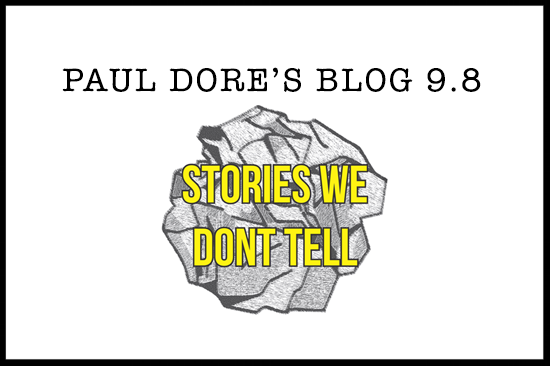 Stories We Don’t Tell specializes in deeply personal stories that are sometimes funny and sometimes sad, but always compelling. One of our goals is to connect the performer and the audience in an intimate way, creating an unforgettable experience for everyone in the space. We started doing this four years ago along with Brianne Benness and the event has grown and evolved over the years. We added a podcast that is going strong at over 80 episodes and continues to be a great way for people to engage with the stories in a totally new way. A blog was created that includes a mix of writing tips, transcripts of podcast episodes and photographs of events. There is a certain amount of magic in the air at a Stories We Don’t Tell event. You don’t really know what’s in store. Sure, we work with a lot of the storytellers, but there is always a feeling of anxiety at the start in anticipation of the unknown. Something could hit a storyteller in an unexpectedly emotional way. An audience member could have an involuntary reaction. Anything can happen. Why is this event important to me? It’s given me a platform where I can experiment with different tones and approaches to storytelling. Just as people believe it takes a while to find a ‘writing voice’, I think it took a while for me to find my ‘performing voice’. A couple of years ago, I told a very sad story and had help from my singer/songwriter friend Arlene Paculan. Arlene helped me with the story and enabled me to dive deep into the feeling of the piece. After that story, I thought long and hard about how I just wanted to make people laugh. I wanted to have something to say, but on the surface try and entertain the audience more. I had cried enough in front of rooms full of people. A few months later, performing with Monica Hamburg, I slipped into a persona where I was trying to be serious but basing the foundation of the story in absurdity. And I talked very slow. The slower I talked and the more serious I became, the more people laughed. I cannot tell you how much I enjoyed the laughter. Not out of any ego-driven way, just that the audience and I were synced and we shared the same sense of humour. Stories We Don’t Tell allows me the freedom to explore. This has not always been the case whenever I’ve gone outside of the event. I’ve come to realize that I’m not really built for events held in bars. I talk too slow. The stories evolve slowly over time. Sometimes the payoff isn’t until the very last line, but to me that just means it better be good. Bar events are not so forgiving and patient. In addition to finding your voice, I think you also find your ideal audience. Mine is at Stories We Don’t Tell. Of course, there are all the other stories and people who have been involved with the event. Our goal with the show is to consistently have six brand new storytellers. As other events in the storytelling community move more and more towards only having comedians or professionals, we love first-timers. Without a doubt, they are usually the best and most memorable stories. They are coming with their best-lived story and the emotions are right near the surface. Where do we go from here? We keep going. Keep telling stories. Taking the summer months off has been hugely beneficial. You need a break when running a monthly event. It provides us with time to review how things are going, how we can make it better and what things we could change. Look for our return in September. Thank you to my co-conspirator Stefan Hostetter, to all the performers that have shared their stories, to the hosts who have welcomed us into their homes and to everyone that has joined us in the audience.